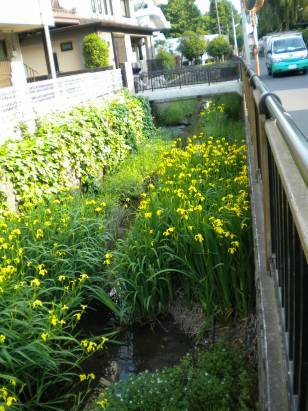 One such small canal near the university where I teach is in magnificent bloom at the moment. I snapped these photos of Ki Shoubu (Yellow Flag Iris) on the way to class as their show of color is nothing short of brilliant. Like fleabane daisy, this iris is technically an invasive here. 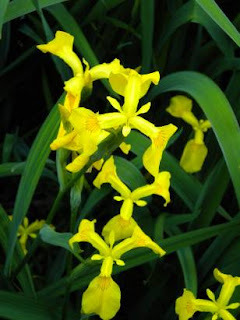 There are native varieties of iris about as well, but the yellow flag seems to be dominating the scene at the moment with their three elongated petal heads. Again according to Kevin Short's Nature in Tokyo, the yellow flag's favorite place is along the shores of ponds or waterways, and they can grow to be a meter tall. These fit the bill perfectly, nearly filling the channel in their enthusiasm. *Thanks to Tokyo Architours for opening up a whole new world of waterways! We hope to see you here again someday. What's your favorite invasive in bloom at the moment? Is that Iris pseudacorus, what we in the Uk know as "yellow flag"? Rhiz, According to Kevin Short's book it is exactly that variety. Is it also considered an invasive in England?